May peace be in our hearts, our families and our world. 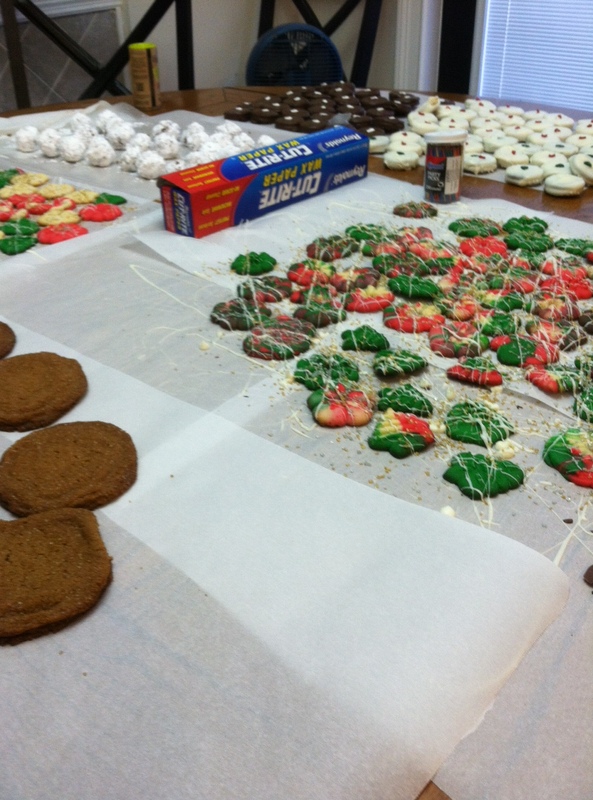 Well, we had a successful cookie weekend, but as for cutting back on the number of cookies, we were not as successful. It was a fabulously fun and tiring weekend. It has become one of those traditions that the bakers and the nibblers all look forward to! I did experiment with a gluten and dairy free recipe that turned out pretty darn awesome. It still may need some tweaking because it was a little dry. Oh, but did it hit the spot! I took my favorite chocolate chip cookie recipe and substituted gluten free flour for the all purpose flour and coconut oil for the butter. The chocolate chips were soy, dairy, and gluten free. I accidentally put an extra 1/4 teaspoon of salt (Himalayan) in the batter, but I think I liked it that way. If I make it again, the salt will be dropped back to recipe levels, just to experiment. Our pitiful and comical relief came from the pups. One was still recovering from surgery and had to be put in a crate to keep him from going bonkers over the kitchen action. Once he fell asleep, he was totally out of it. His brother enjoyed poaching chew toys when the patient was sleeping or out on a bathroom break. Quite the pair!